Dennis Curtis is a Clinical Professor Emeritus of Law at Yale Law School, where he teaches courses on sentencing and professional responsibility and directs a clinical course in which students work with Connecticut’s State Disciplinary Counsel to prosecute lawyers who violate rules of professional conduct. 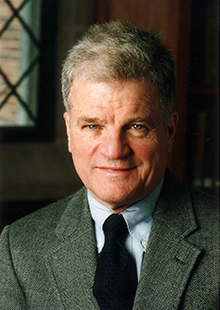 Dennis Curtis is Clinical Professor Emeritus of Law at Yale Law School, where he teaches courses on sentencing and professional responsibility and directs a clinical course in which students work with Connecticut’s State Disciplinary Counsel to prosecute lawyers who violate rules of professional conduct. Professor Curtis was one of the pioneers of clinical education in the 1970s. He created a program at Yale in which faculty supervised students working with indigent clients in a variety of contexts so as to gain insights into an area of substantive law in an administrative-regulatory context. For example, Yale Law students represented federal inmates at Danbury Federal Correctional Institution, and patients at Connecticut Valley mental hospital. At U.S.C., where he taught from 1981 to 1996, students assisted federal inmates at Terminal Island Federal Correctional Institution and state inmates at the California Institute for Women at Frontera, California. In addition, students at both schools were active in legal service programs on behalf of aliens, the elderly, the homeless, the developmentally disabled, and clients of legal aid societies. In 1997, upon returning to Yale Law School, Professor Curtis developed a new clinical offering with the Connecticut agency charged with administering the lawyer disciplinary process. Professor Curtis has written several essays on clinical education and the legal profession, including: Educating Lawyers: Clinical Programs and the Legal Profession, Keynote Address at World Clinical Conference, Waseda University, Tokyo, Japan, September 8, 2006 (published as translated into Japanese in 2007); Teaching Billing: Metrics of Value in Law Firms and Law Schools (with Judith Resnik), 54 Stanford Law Review 1409 (2002); Grieving Criminal Defense Lawyers (with Judith Resnik), 70 Fordham Law Review 1615 (2002); and Can Law Schools and Big Law Firms Be Friends? 74 Southern California Law Review 65 (2000). In addition, since the late 1990s, Professor Curtis has joined sitting judges and law professors in shaping new courses on the law of sentencing. Professor Curtis’s writings in the area of post-conviction justice include Mistretta and Metaphor, 66 Southern California Law Review 607 (1992); The Reform of Federal Sentencing and Parole Laws, National Prison Project Journal, Fall 1987; and the book Toward a Just and Effective Sentencing System: Agenda for Legislative Reform (with Pierce O’Donnell and Michael Churgin) (Praeger 1979). Professor Curtis has also recently completed a book, Representing Justice: Invention, Controversy, and Rights in City-States and Democratic Courtrooms (Yale University Press, 2011, co-author Professor Judith Resnik) that addresses the relationship between adjudication and democracy. Related co-authored articles include Images of Justice, 96 Yale Law Journal 1727 (1987); From “Rites” to “Rights” of Audience: The Utilities and Contingencies of the Public’s Role in Court-Based Processes in Representations of Justice 195-236 (eds. Antoine Masson and Kevin O’Connor, P.I.E.- Peter Lang, 2007), and Representing Justice: From Renaissance Iconography to Twenty-First Century Courthouses, Henry la Barre Jayne Lecture, in 151 Proceedings of the American Philosophical Society 139 (2007). Professor Curtis has testified before congressional and judicial committees on sentencing, parole, and post-conviction remedies. From 1990 to 1995, he served as the first President of the Los Angeles City Ethics Commission, created when the voters in Los Angeles approved a change in the City Charter. The jurisdiction of the Ethics Commission included campaign finance laws and regulations and governmental ethics, and the Commission distributed millions of dollars in matching campaign funds to eligible candidates for city elections. In 2007, Professor Curtis was appointed to serve on the New Haven Democracy Fund Board, the government entity charged with distributing public funds for political campaigns. He is a member of the American Law Institute and serves as a consultant for law schools through the Association of American Law Schools. He also chaired the AALS’s Committee on Clinical Legal Education and served as a director of the Legal Aid Foundation of Los Angeles. Professor Curtis received his B.S. from the U.S. Naval Academy and his LL.B. from Yale. Representing Justice: The Rise and Fall of Adjudication as Seen From Renaissance Iconography to Twenty-First Century Courthouses (with Judith Resnik) (Yale University Press). Toward a Just and Effective Sentencing System: Agenda for Legislative Reform (with Pierce O’Donnell and Michael Churgin). From “Rites” to “Rights” of Audience: The Utilities and Contingencies of the Public’s Role in Court-Based Processes in Representations of Justice 195 – 236 (with Judith Resnik) (eds. Antoine Masson and Kevin O’Connor, P.I.E. – Peter Lang, 2007). Representing Justice: From Renaissance Iconography to Twenty First Century Courts (with Judith Resnik), Henry la Barre Jayne Lecture, 151 Proceedings of the American Philosophical Society 139 (2007). Educating Lawyers: Clinical Programs and the Legal Profession, Keynote Address at World Clinical Conference, Waseda University, Tokyo, Japan, Septemeber 8, 2006 (publication forthcoming, 2007). Teaching Billing: Metrics of Value in Law Firms and Law Schools (with Judith Resnik), 54 Stanford Law Review (2002). Can Law Schools and Big Firms Be Friends? 74 Southern California Law Review 65, (2000). Grieving Criminal Defense Lawyers (with Judith Resnik), 70 Fordham Law Review 1615 (2002). Individuals within the Aggregate: Relationships, Representation and Fees (with Judith Resnik and Deborah R. Hensler), 71 NYU Law Review 296 (1996). The Effect of Federalization on the Defense Function, 543 Annals of the American Academy of Political and Social Science 85 (1996). Congressional Powers and Federal Judicial Burdens, 46 Hastings Law Journal 1019 (1995). Old Knights and New Champions: Kaye, Scholer and the Office of Thrift Supervision, and the Pursuit of the Dollar, 66 Southern California Law Review 985 (1993). Mistretta and Metaphor, 66 Southern California Law Review 607 (1992). The Fake Trial, 65 California Law Review 1523 (1992). Images of Justice (with Judith Resnik), 96 Yale Law Journal 1727 (1987). The Reform of Federal Sentencing and Parole Laws, National Prison Project Journal, Fall 1987. “Here’s What We Do:” Some notes about Clinical Legal Education (with Stephen Wizner), 29, Cleveland State Law Review, 673 (1980). Federal Judicial Power, Parole Guidelines, and Sentence Reform, in Prisoners’ Rights Sourcebook, Robbins, ed. (Clark Boardman, 1980). The Federal Parole System, Prisoners’ Rights, (PLI, 1979). Comment, Judicial Intervention in Church Property Disputes—Some Constitutional Considerations, 74 Yale Law Journal 1113 (1965).